Every shade was formulated to provide a specific increase in temperature for desired results also this heat allows the certified organic oils and keratin to get deep into the hair, giving the hair maximum shine. 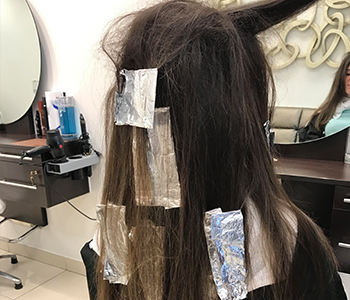 Although the hair stylists at Nela Hair Salon have many years of experience they never stop learning and are always eager to bring the latest to their clients. Keeping up with the newest techniques in hair color requires taking ongoing extensive professional seminars lead by other talented professionals who are watching the advancements of technology on a daily basis. This talented group all too familiar with the latest trends with balayage, hair painting, and sunkissed high lights, these techniques can offer a more natural look to highlighting hair by doing away with the more uniform foiling process. Find us in Tenafly New Jersey. Fantasy colors such as Blorange are all the rage this season, whatever your preference, this Bergen County salon will surly offer it. While still specializing in traditional highlighting and other lightening techniques.